Recharge like a Wildcat and get energised with this delicious, protein-packed berry smoothie. Delivering a powerful protein hit, with 33g per serve, the RedArmy smoothie is an ideal way to spice up your breakfast, refuel on the go or recover from a tough workout the Wildcats way. Place all ingredients in blender. Blend until smooth, garnish as desired and enjoy. Nutritional powerhouses, blueberries and raspberries are both low in calories, loaded with dietary fibre, and an excellent source of Vitamin C and manganese. Blueberries and raspberries are also high in anti-oxidants, which work to neutralise free radicals linked to cancer, cardiovascular disease and other age-related conditions. Vitalstrength 100% Whey contains whey proteins that are considered by many athletes, bodybuilders and fitness experts as the best protein for building and repairing muscle. Whey proteins help to prolong fat metabolism, boost muscle recovery and promote lean muscle growth. Cinnamon has been shown to help control blood sugar levels, lower harmful LDL cholesterol and triglycerides, improve circulation and assist with weight control. This powerful antioxidant also improves digestion and can boost brain power. Rich in essential electrolytes, coconut water is an excellent hydration booster. With more potassium than your standard sports drink, and far less refined sugar, it’s a much healthier and more effective choice. It’s also been said to help aid digestion, assist weight loss and reduce blood pressure. 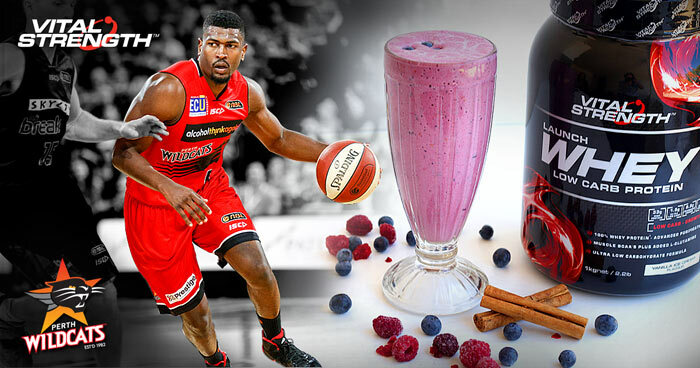 Vitalstrength is the official sports nutrition supplement partner of the Perth Wildcats. Formulated using premium quality ingredients and strict quality and safety standards, Vitalstrength products are trusted to fuel Wildcats training and speed recovery to keep players at the top of their game.